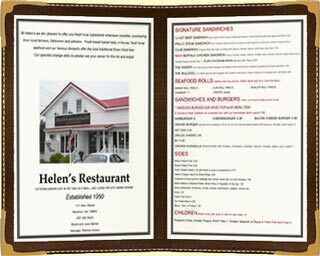 Download and view our current menu using the links below. If you have special dietary needs, please let your server know. Desserts are prepared fresh daily. Take a stroll past our dessert display case to see what's available or ask your server. Learn more about our desserts on our Homemade Pies & Desserts page. We feature Tide Mill's Ricotta in several special dishes, including Crabmeat Canneloni, Lasagna Bolognese, several other pasta dishes, and desserts. We have to thank these folks for supplying us with the most important ingredient in our most popular salad, our Goat Cheese Salad! We also serve Gardenside Dairy's Garlic and Dill Chevre with crackers as an appetizer. Maine Shellfish Company, Ellsworth - Shrimp, etc.